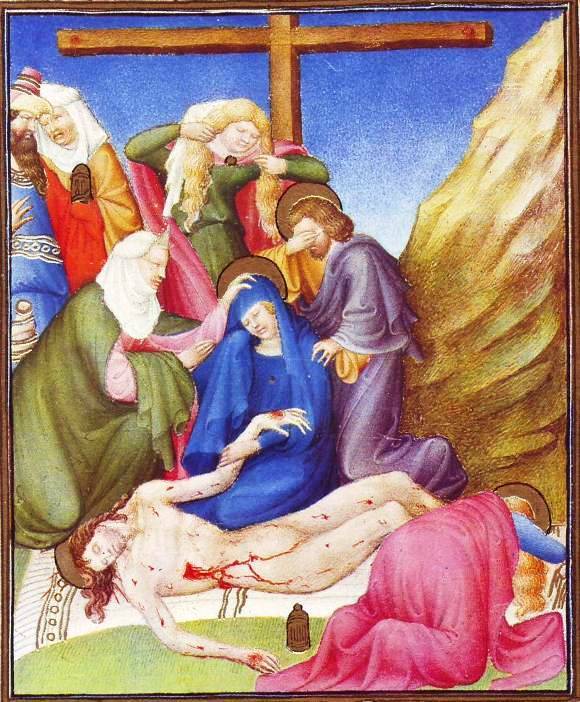 The subject of the Lamentation, with its vision of the naked, wounded corpse of Christ stretched on the ground below the cross, provided an unequaled opportunity to show the impact of Christ’s death upon his mother, his close relatives, and his friends. The de Berry miniature above is apparently the ﬁrst example of this scene by a French painter. But a few years earlier the scene had been painted by an Italian illuminator into the Brussels Hours of the Duke of Berry. Although the artist of the Duc de Berry’s Book of Hours did not adopt the composition of that miniature, his imposing ﬁgures and geometric design show again the depth of his understanding of Italian painting. 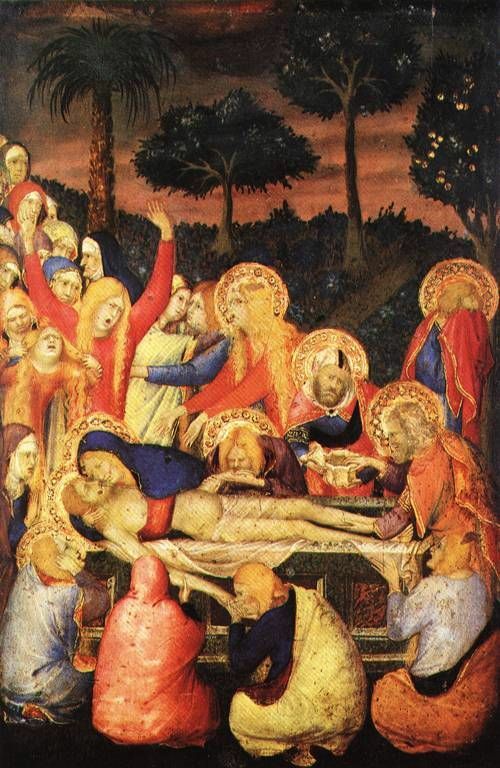 He was no doubt impressed by the mourner who bends forward and tears her hair in Simone Martini’s panel of the Entombment, now in Berlin but then probably at Dijon, the Burgundian capital which he certainly visited. His own painting has a similar figure. 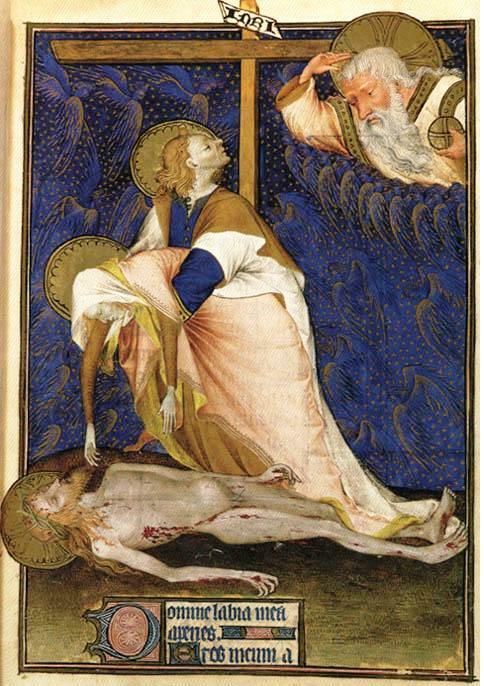 The artist of the Book of Hours was impressed also by the movement of Simone’s St. John, who covers his grief-stricken face with his mantle (click on the image below to see an enlargement of this painting). Here, St. John maintains the idea of concealment by laying a hand on his face—an equally unusual and expressive gesture. It may once again have been the Brussels Hours that suggested to the artist the dramatic foreshortened ﬁgure of the Magdalen. 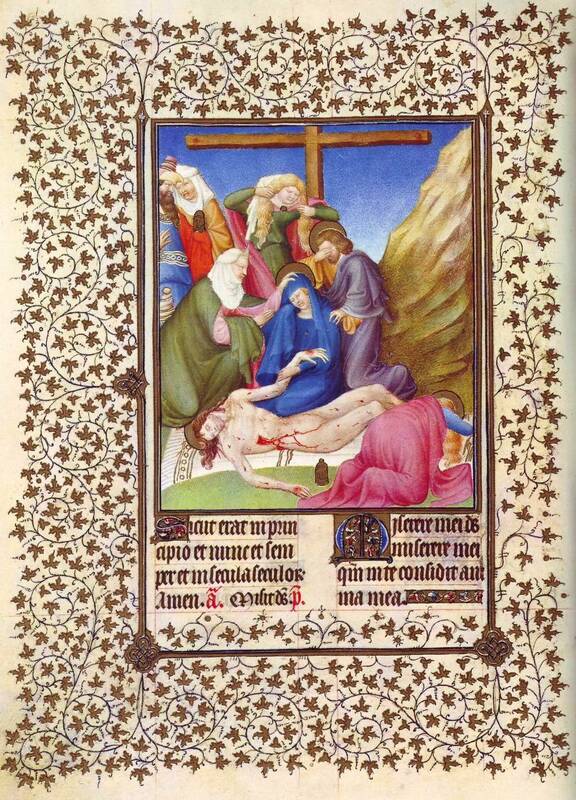 The more dramatic Magdalen in the Belles Heures kisses the feet, not a hand, of Christ. The foreshortening, too, is more drastic. 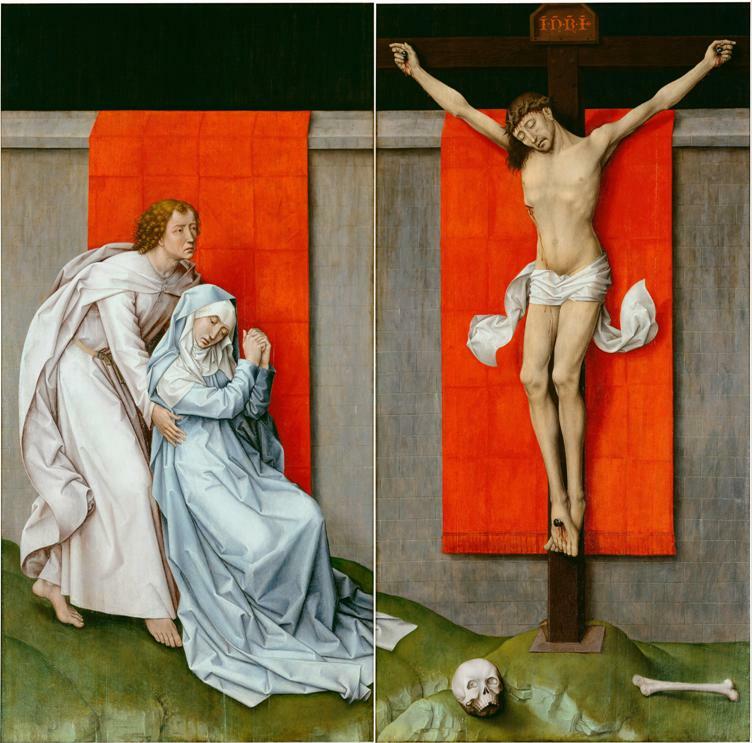 Artists of this period seem to have had no qualms about showing Jesus naked – as in fact he would have been when crucified. Only later did the audience for paintings of this subject insist that Jesus be modestly covered. Notice the woman who lays a comforting hand on the Virgin’s head. The signiﬁcance of her solicitude is increased by her size and her bearing – a remarkably majestic ﬁgure. The Virgin alongside seems small. Eyes closed, she slumps, without hope, letting the arm of Christ lie limply in her left hand, while with her right she has raised her mantle as if to wipe the tears. Entirely drained of vitality, she yet remains the central ﬁgure. Hers is the strongest color, and the movements turn about her like the spokes of a wheel. 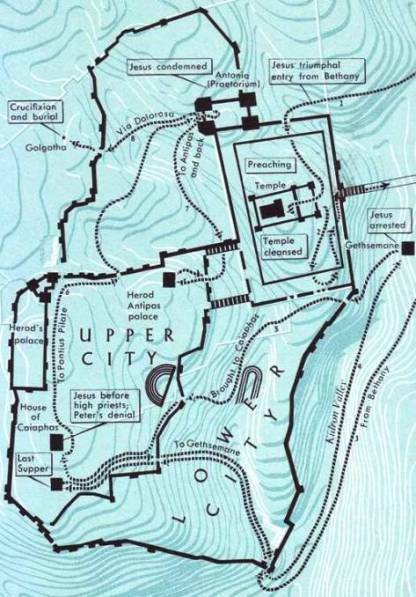 It is to her that the companions (except the Magdalen} turn.